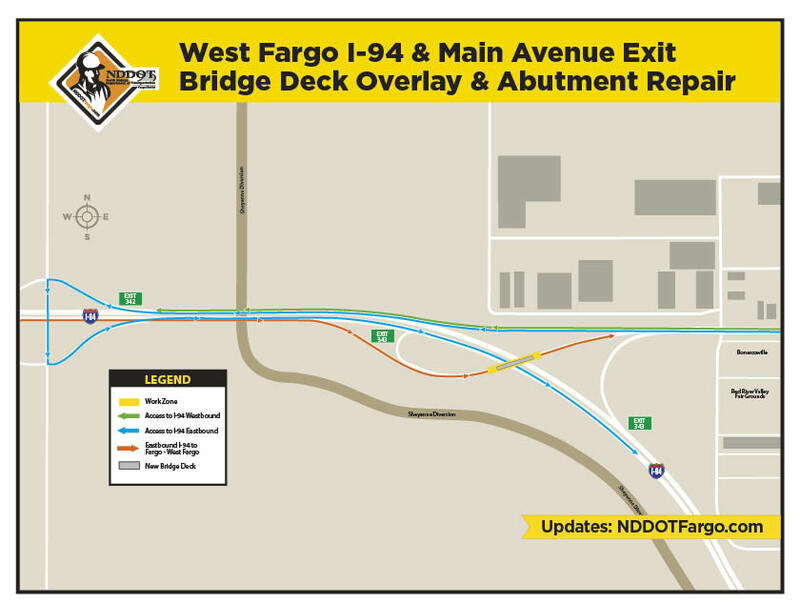 This is a rehabilitation bridge project and the bridge deck will not be fully reconstructed at Exit 343 (Main Avenue). The entire deck will be milled and overlaid with new concrete, and west abutment will be repaired. Project work will take 4-5 months. Crews started on the project in May with a week suspension period during the Red River Valley Fair in July. Interstate 94 Exit 343 (Main Avenue/US 10) in West Fargo. Eastbound and westbound I-94 traffic will be maintained. One temporary lane closure on I-94 may occur when crews are working under the bridge. this detour is 2.47 miles. The west abutment has moved causing the top portion of the abutment wings to break. The west end of the deck is deteriorating and full depth holes have formed in the deck. The west end of the deck is delaminated. If left untreated, the bridge deck is susceptible to spalling, which is when the top layer of the deck concrete becomes loose. NDDOT has funded the entire bridge project with state and federal funds. Bridge project cost is estimated at $650,000.